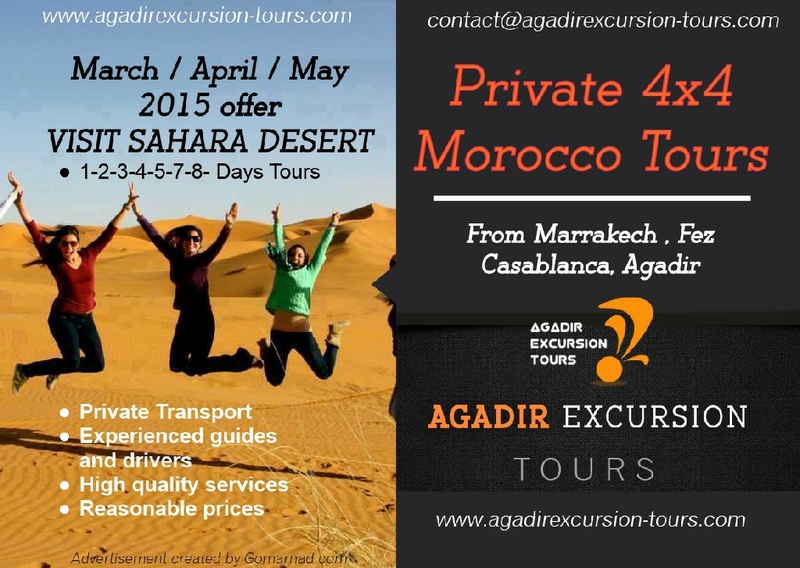 Agadir Excursion Tours is a registered Moroccan operator organising private tailor-made tours throughout Morocco. If you are looking for best Marrakech or Agadir private tours, this is your best option! In our best travel website you will find tailor-made Morocco tours, fitted and different to each visitor. We offers you always a unique and flexible itineraries for the best experience in all over morocco (Imperial cities, desert, the coast) with reasonable prices, including transportation, bivouac and accommodation. We specialise in Sahara desert tours, desert excursions to Erg Chigaga in Zagora region and Erg Chebbi dunes in Merzouga. Our mission is to help you discover and experience the fascinating Morocco and to learn about our history, our culture, meet with local people and enjoy the delicious Moroccan food. Please note that all Agadir Excursion Tours can be customized based on your budget and interests, so please don't hesitate to contact us with any request you may have for your dream vacation, and this is our experts are ready to design a special tour for you. Let us help you experience the best of Morocco. Participating at our Morocco tour will give you an opportunity to see best of Morocco with the eyes of the insider.